It’s rich fudge goodness. It’s a brownie. It’s pudding. It’s only 6 ingredients. It’s simple. It’s DELICIOUS! And it’s gluten-free! Not to be boastful, but I may have just made the most awesome, kid-loved treat ever! Okay… who’s kidding… my hubby and I love it as much as the kids! The nice thing is each piece, both the Fudge Brownie and the chocolate pudding, can be served separately or add some Cool Whip and it makes a fast, fancy dessert! For the pudding portion of the recipe, well, it’s just pudding. Plain and simple. I buy the sugar-free and make it with 1% milk. You can’t tell the difference in taste from the regular chocolate pudding. It’s just not all going straight to my waist! Which is great about this whole recipe… it’s loaded with flavor, but not calories! Make chocolate pudding (with pudding directions on package) in advance. Refrigerate so it can set up. Make the Flourless Fudge Brownie (recipe below). Cut the Flourless Fudge Brownie into chunks. 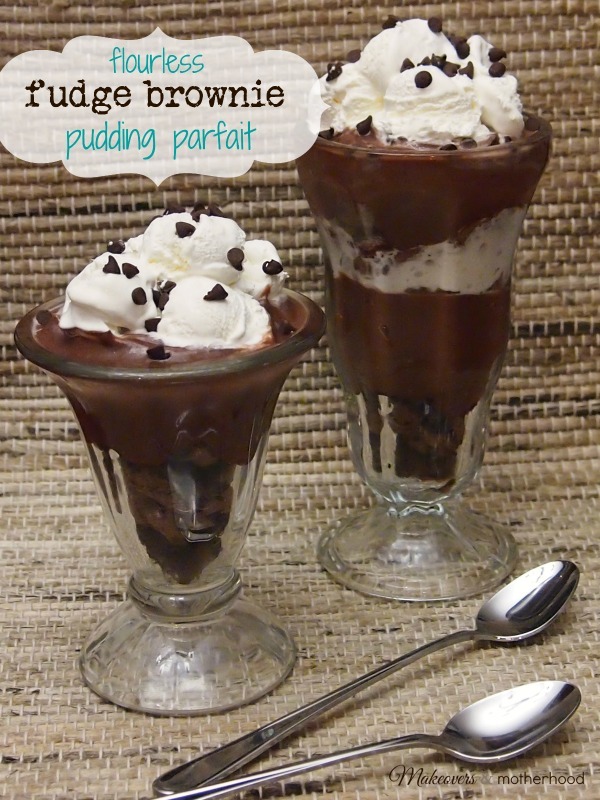 Layer a parfait glass (or any clear cup or glass) with the Flourless Fudge Brownie, pudding, and Cool Whip. Repeat layers if you have a tall glass. However, it is very rich so you may want to keep your parfait small. Add chocolate sprinkles, mini chocolate chips, or chocolate shavings to the top. Rich fudgy goodness in a brownie! YUM! Lightly grease or butter an 8"x8" pan. Mix powdered sugar, cocoa powder, and sea salt. Add egg whites and vanilla. Blend. Pour into 8x8 pan. Bake at 350 for 30 minutes. Spoons up, friends! Happy eating!